Now that Jinks Jenkin is firmly established as our bass man we thought it's time to get cracking on our next cd. Recording is under way - but it'll take a while. We're in no rush. We'll keep you updatd here. Baldrick's Plan are a male trio, specialising in strong harmony singing, largely based within English traditional music, but also including songs, ancient and modern, from other backgrounds and traditions. 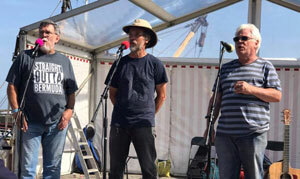 They are based in West Cornwall and are all seasoned performers on the folk music scene. While material tends to be delivered 'a capella' style, there are always songs that the band would like to do which demand accompaniment. So, where appropriate, they have developed, alongside their unaccompanied material, a body of songs which are enhanced by Peter's guitar. 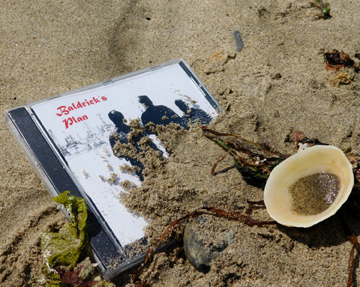 If you're interested in finding out what Baldrick's Plan are about, and what they sound like, please visit the Samples page, where examples of their singing can be heard. Also, if you're down this way, don't forget that Baldrick's Plan are resident singers at the Singing Cellar Folk and Acoustic Music Club at the Turk's Head, Chapel Street, Penzance on the third Friday of each month. It's a great venue with a fabulous atmosphere and is just the place to air your lungs! We'd love to see you there whether you are a listener or a performer.